3034dShaun Assael, Luke Cyphers, Max Klinger, Ryan McGee and Alyssa Roenigk. Photographs by Gillian Laub. Shaun Assael, Luke Cyphers, Max Klinger, Ryan McGee and Alyssa Roenigk. Photographs by Gillian Laub. AGE: 21 | HOME: Diamond Bar, Calif. The youngest member of the U.S. national team, Morgan scored its biggest goal of 2010, drilling a shot in stoppage time for a 1-0 win over Italy in a crucial World Cup qualifier on Nov. 20. (A month earlier, the fleet forward nailed a left-footed equalizer in the 83rd minute of a friendly with China.) "She can score with either foot or with her head," says soccer analyst Tony DiCicco, coach of the U.S. squad that won the 1999 World Cup. "She has a nose for the goal." And she just might smell victory next summer in Germany. FEARLESS FACTOR: "I've grown up with coaches saying, If you're around the box, always think about shooting first." TRADITIONAL VALUES: "I really looked up to Kristine Lilly when I was little, so I wore No. 13 until I made the national team. She said she'll pass it on to me when she retires." FALLBACK PLAN: "I love running. I would probably be doing the 200 or 4x400 in track." AGE: 18 | HOME: Shreveport, La. Let's face it: This isn't exactly the golden age of American men's tennis. So when Harrison, ranked 173rd in the world, upset 15th-seeded Ivan Ljubicic in the opening round of the 2010 US Open, fans rejoiced. (He lost his next match in five sets to No. 36 Sergiy Stakhovsky.) "I love that Ryan has an all-around game," says Billie Jean King. "He can serve and hit off the ground, and he's strong at the net. He's going to have a great future." With Harrison having earned a spot in this month's Australian Open, the future might already be here. PICK A PRO, ANY PRO: "I've always had an attacking game because I love Pete Sampras. I'm also trying to play from the backcourt like Novak Djokovic, and kick serve and volley like Patrick Rafter." HIDDEN TALENT: "I have a really good memory. I can tell you about every point of every game I've played this year -- especially in the matches I've lost." FALLBACK PLAN: "I'm 1,000 percent sure I'd play football. I play five-on-five, and I'm a fantasy fanatic." AGE 21 | HOME: Tallahassee, Fla. This guy didn't exceed expectations in 2010; he rolled and soared right over them. 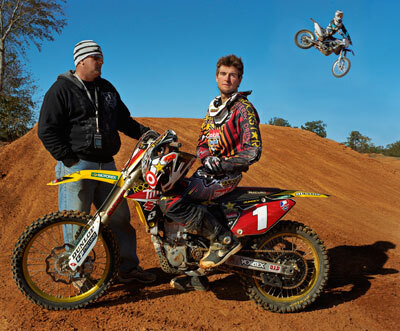 Dungey took home AMA championship titles in supercross and motocross, the first rookie ever to do so. In fact, after the 5'10", 150-pound racer moved up to the 450 class -- the big leagues of motocross -- he won every major contest on the circuit. "Dungey is gifted genetically," says Ricky Carmichael, the most decorated motocross rider in history. "He's the future of our sport." FAMILY MATTERS: "My dad, Troy [far left], is still my coach and practice mechanic. We started this together, and we want to finish it together." FLYING SOLO: "I played basketball until eighth grade, baseball until fifth grade and football for a year in middle school. But I always wanted to be the No. 1 guy. Being on a dirt bike is freedom. You control it, and the sky's the limit." FALLBACK PLAN: "I'd love to have my own company or maybe work construction, like my grandpa did when I was younger." AGE: 25 | HOME: Huntington Beach, Calif.
After winning the U.S. Open, surfing's crown jewel, two years in a row, Simpson would love to snag a world championship. Of course, 10-time king Kelly Slater (will he retire?) might have something to say about that. No matter the competition, Simpson will rely on a training strategy suited more for the gridiron than the barrel. As the son of former NFL safety Bill Simpson, he's big on "double days," which include multiple practices, plyometric workouts and tape-watching sessions. 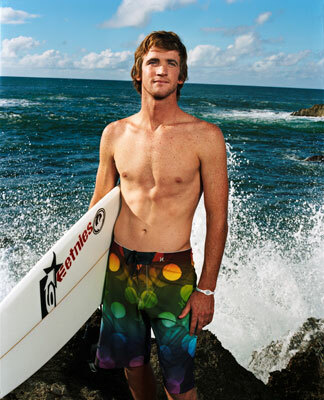 "He's really no slouch in any area," says 2001 ASP world champ C.J. Hobgood. "He does big turns and aerials with the best of them." Which is what Simpson might be soon enough. VICTORY IS SWEET: "At the U.S. Open in 2010, I beat Slater in the semifinals in some serious surf. It was surreal." ROOM FOR IMPROVEMENT: "I grew up mostly around beach breaks, so I'm still learning how to surf points and reef waves really well." FALLBACK PLAN: "I've got sports in my blood, and I'm decent at basketball, so I'd probably be a point guard." The latest buzzword in women's hoops is pronounced oh-GOO-muh-kay. Can you say it fast twice? Because Stanford's sister act has the Cardinal eyeing a fourth straight trip to the Final Four. Nneka, as the 6'2" junior is known, was an All-America last season, while Chiney, a 6'3" freshman, was the nation's top recruit (and winner of the Gatorade High School Athlete of the Year award). Both are long and athletic, but they're not always in lockstep. "Nneka is very unselfish," says Cardinal coach Tara VanDerveer. "Chiney's more aggressive." 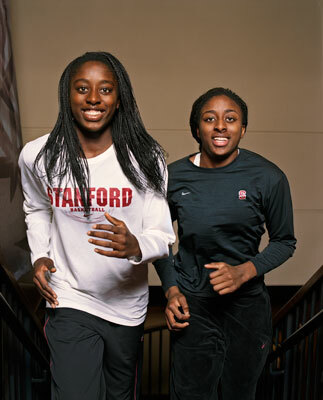 With Chiney's quickness on the wing and Nneka's relentlessness inside, Stanford will be a formidable foe come March. Tough enough to take down mighty UConn? Now that would be buzzworthy. TWO CAN'T PLAY THAT GAME: "We only shoot around, because we're so competitive," Chiney says. "We'd kill each other one-on-one." THINKING BIG: "My teammates call me The Overanalyzer," Nneka says. "I definitely am. My sister doesn't think -- she just does it." FALLBACK PLAN: "I'd probably be more actively pursuing a medical degree," Nneka says. "And playing volleyball." Adds Chiney, "We both went to state in volleyball." AGE: 19 | HOME: Alpine, Calif.
Named for Cole Trickle, the up-and-coming driver in "Days of Thunder," Whitt has certainly embraced the handle. His 15th-place finish at Phoenix in November, in his Nationwide Series debut, turned heads. "That's a hard track, even for vets," says fellow racer Brian Vickers. "It's a big deal for a guy who's just started racing stock cars to compete for wins right off the bat." Whitt doesn't have a Sprint Cup ride yet (Red Bull's spots belong to Vickers and Kasey Kahne), but he won't be stuck in the garage for long. ATTENTION-GETTER: "I passed Tony Stewart to make the finals at the 2008 Chili Bowl. Later that year, I won the USAC National Midget Series championship, and beat Tony's team to do it. He came to Victory Lane and congratulated me." 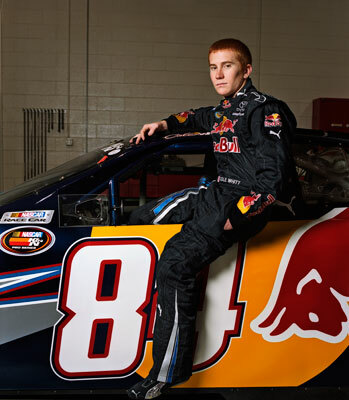 MODEL BEHAVIOR: "I don't drive like he did, but Dale Earnhardt was the man. Even if he didn't win, he was the story. He had that swagger." FALLBACK PLAN: "My dad has a pretty successful plumbing business, but I'm not ready to do that yet."